Natural Area was contracted by the City of Armadale to undertake drainage swale stabilisation and landscaping works within Forrestdale Business Park in early 2016. The works involved site preparation, installation of Jute matting, supply and installation of suitable native tubestock and ongoing maintenance for two years following practical completion. 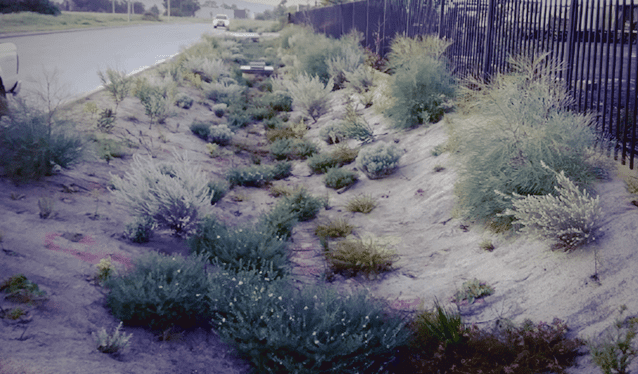 These works are indicative of a new style of drainage swale management within urbanised areas, where innovative design means that drainage swales and basins are no longer simply channels to collect and transport stormwater from point A to point B. Other factors such as water quality management and dispersal of weed seed are now taken into consideration, meaning that stormwater entering tributaries of the Swan and Canning Rivers is cleaner. With the right tubestock selection, ongoing maintenance within these drainage swales is reduced. Natural Area also completed Stage 1 of the drainage swale works for the City in 2015; to date works have been very successful in mitigating erosion, preventing weed growth and providing an aesthetically pleasing landscape for the Forrestdale Business Park.